Graphic images received by ICT show a monk with a severe head wound after the shooting in Tawu (Chinese: Dawu/Daofu), Kardze (Chinese: Ganzi) Tibetan Autonomous Prefecture (in the Tibetan area of Kham) in Sichuan. The monk was identified as Tashi Sonam from Nyitso monastery. Another monk who was shot in the head has been identified as Ugyen Tashi (also known as Tashi Gyaltsen) and is said to be in a critical condition in hospital in Chengdu, the provincial capital. Several other Tibetans were seriously injured and are being treated in Dartsedo (Chinese: Kangding) in Kardze, according to exile Tibetan sources. The monk depicted in images received from Tibet has been named as Tashi Sonam, who is now in hospital in Dartsedo, according to the same sources. Most of the Tibetans who were shot are in the same hospital and have been identified so far as Tsering Dhondup, a ‘disciplinarian’ monk at Nyitso monastery, a layperson, Tashi Gyaltsen, two other laypeople named as Tashi and Nyandak, and two nuns. A monk, Jangchub Dorjee, was also injured in the shooting; a Tibetan former political prisoner in exile from Tawu said that he is the younger brother of Palden Choetso, a nun from the Ganden Jangchup Choeling Nunnery in Tawu who set fire to herself and died on November 3, 2011. The shooting on July 6 in Tawu follows the self-immolation of a Tibetan nun, Wangchen Dolma, near Nyitso monastery last month, during a gathering of several thousand monks for an inter-monastic debate and teaching. The nun, in her early thirties, died on June 14. After the self-immolation, communications were restricted in the area and surveillance of monks at Nyitso monastery, a historical center of Tibetan culture, was intensified. 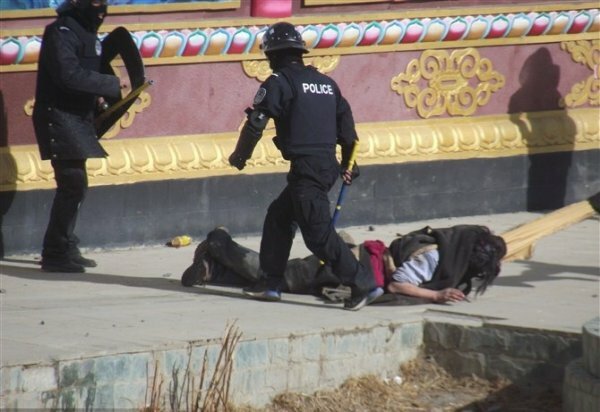 In 2011, security personnel were deployed at the same location as the shooting in Tawu to prevent peaceful celebrations of the Dalai Lama’s birthday, and thousands of Tibetans were stopped from making offerings at a holy mountain during the early hours of the Dalai Lama’s birthday. Even so, images emerged depicting plumes of incense smoke, burnt as an offering for the well-being of the Dalai Lama, arising from houses on a hillside in the area on the birthday of the exiled religious leader that year. Proposals to display portraits of the Dalai Lama, end denunciation of the Tibetan leader, and lessen police presence in monasteries were discussed at a series of meetings in Qinghai in recent weeks, including a discussion at Chabcha, although it is not known whether they will be implemented on an experimental basis or not. In the Tibet Autonomous Region there is no sign of any images of the Dalai Lama or celebrations of the birthday being allowed, as the anti-Dalai Lama campaign has been stringently enforced as a core policy in the area since the mid-1990s.